Westchester's #1 Window Cleaning Company! Do you live in CT? We also serve Southwestern Fairfield County. Have you heard? Westchester is in for an early Spring! Let the clean-up season begin! Have a lengthy list of home-improvement projects? What about the windows? 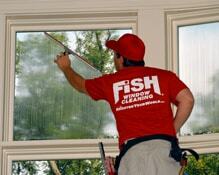 "Fish Window Cleaning saved me lots of time and was even able to clean storms I was having trouble prying off! I highly recommend Fish for window cleaning!" What to do... paint? Update the kitchen or bathroom?